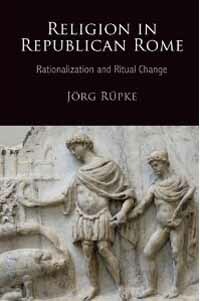 Jörg Rüpke is without question the most prolific scholar currently working in the area of Roman religion, and many would add the most creative, innovative, and provocative as well. Although his work ranges very broadly, much of it has focused on the religion of the Roman republic, and the present volume presents, if not a summa of his research in that area, at least a handy compendium of his insights and conclusions. As he notes in the acknowledgements at the end of the volume, he began work on the book in 2002/3, and most of the chapters derive from articles that have appeared since then in various specialist publications. As the two-and-a-half-page list of his articles and books in the bibliography makes clear, however, his engagement with the issues and themes that lie at the book's heart goes back another ten years before that. 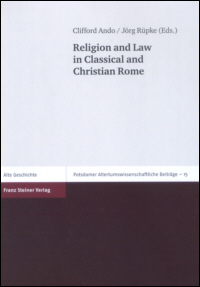 The volume thus provides a valuable overview of Rüpke's thinking on Roman republican religion that makes it more easily available to those who lack access to a major research library. 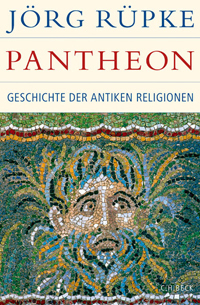 Rüpke notes in his introduction that "a serious history of republican religion has not been written" and that "this book fills this gap in scholarship by pursuing an interest in both Roman history and the history of religion", focusing primarily "on the period from roughly 240 to 40 B.C.E." (4); in a footnote he points out that the standard works in English by Mary Beard, John North, and Simon Price do not for the most part "attempt a narrative" (221 n. 9). It is not clear to me that Rüpke himself has really attempted a narrative either; instead, he provides the reader with a serious of case studies that deal with a set of interrelated issues, which in a few interspersed chapters he pauses to consider in more general terms. This is certainly not a narrative history in the sense of an histoire événementielle; although Rüpke discusses a range of 'events', his narrative exists more on the abstract level of analysis than on the concrete level of events. Anyone looking for basic historical data, e.g., about the construction of a particular temple or the institution of a particular ritual, will in most cases need to look elsewhere. The issues that Rüpke investigates here, as the subtitle announces, center around the idea of rationalization. By this he means 'the systematization - or attempted systematization - of practice' (2), with a particular focus on 'communicative practice and the institutionalization of knowledge production and interpretive rule-making' (3). After an initial chapter that sketches out what we are know about Roman religion in the early republic, there is a group of four chapters that focus on large-scale public rituals as communicative strategies, including case studies on the tragedies of Accius and the ceremony of the triumph. Chapter 6 introduces a key topic, the use of writing as an instrument for systematization, by examining the treatment of religion in early Roman epic. This is followed by a second group of chapters that deal with other uses of writing: the calendar, historiography and law, and the late republican charter of a Roman colony in Spain. Chapter 10 is again programmatic, setting out the book's final topics of antiquarianism and philosophy, which Rüpke then examines in more detail in chapters focusing on Fulvius' fasti and their relation to the work of Ennius, on the antiquarian works of Varro, and on Cicero's treatment of religion in his philosophical dialogues. A final chapter provides summary discussions of the book's key themes: public spaces, Hellenization, ritualization, writing, and rationalization. 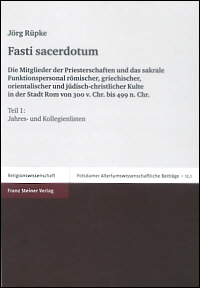 This brief overview of the book's contents gives some idea of the wide range of topics that Rüpke covers, and the methodologies he employs are equally diverse, extending from the historical analysis of calendrical reform to the philological analysis of the testimonia (quoted in full in both Latin and English) for Fulvius' fasti. Rüpke's analysis tends to operate at a fairly high level of abstraction, even when he is dealing a very specific set of data, and at times I found it hard to understand the exact connection between analysis and data or between one topic or another. In this respect the final chapter is particularly helpful, for the summary discussions here do an excellent job of pulling together the various topics and presenting them in a clear framework; many readers might do well to proceed immediately from the introduction to this chapter. One particularly important conclusion, which will be of considerable interest both to Roman historians and to historians of religion, is that by means of its steadily increasing systematization and institutionalization, "from the late fourth century onward, religion became the decisive medium for public control of aristocratic competition" (213). It would be wrong, however, to take this as the book's central thesis, since as Rüpke himself stresses the book does not and cannot have a single overarching thesis. 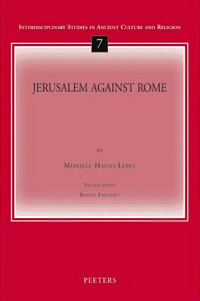 The key terms that he revisits in the concluding chapter "do not explain anything in and of themselves" but rather serve "to organize my description of complex cultural changes in the Roman Republic from the third to the first century, and thus to point to the places of religion within this process [...]. If "religion" does not denote any unified phenomenon in this period - and this is a claim I have to make - it cannot attain a single place in this model" (206). It is in this last statement that the book's most important contribution lies. Over the last several decades a number of scholars have argued that 'religion' is in many ways a very problematic conceptual category to use in analyzing the Roman world, since there does not seem to have been, to use Rüpke's formulation, "any unified phenomenon" that corresponds to it. Instead, ways of thinking about or dealing with the superhuman sphere show up in a wide variety of contexts that were for the most part not correlated with each other at all. Earlier generations of scholars dealt with this problem by restricting 'Roman religion' to ritual practices, especially public rituals, and excluding from consideration all other modes of conceptualizing the superhuman sphere; the result, however, was a severely impoverished version of Roman religion that ultimately proved to be a scholarly dead end. Adding back into the mix the full range of material, including literary and philosophical texts, has allowed for a much richer exploration of the myriad ways that Romans thought about the divine world and their interactions with it, but has also presented a practical challenge: if 'religion' was indeed not a discrete phenomenon in the Roman world, then what is a book about 'Roman religion' actually about? Rüpke provides us with an example: it is a book that is as much about Roman social, cultural, and literary history as what we could call religion. It is by pursuing this example that future progress in the field will be made.